While Storm Erik gripped the nation the RS Aero Youth Team prepared for an exiting weekend of Winter Training at Datchet SC. 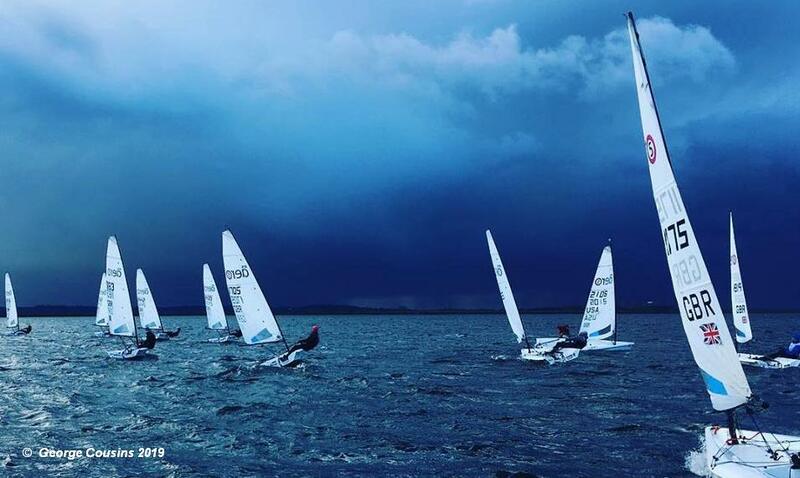 On the Saturday morning the conditions for the 30+ sailors in the RS Aero Rooster Youth Team didn’t look promising with gusts of 35 knots, but the wind finally dropped after lunch and we managed a great session out on the water. Launching into the onshore breeze was made easier by the massive teamwork and help shown by the whole squad and especially Phoebe’s dad who was waist deep in water most of the time. The focus was on upwind speed control and slalom downwind with our rudders tied to our main-sheets emphasizing minimal rudder movements. This was a great exercise as it really showed how easy it is to over-steer. On Sunday, it was a prompt start, with a quick briefing and getting straight out on the water to make the most of the sailing time. The focus for the morning was straight line speed with rabbit runs, tacking on the whistle and a big focus on having a flat boat. The video footage showed in the briefing helped understand at what point the boat is really flat. After warming up over lunch, the afternoon session focused on penalty turns. What started off as rabbit runs with 360s and 720s on the whistle, turned into racing, which put all this together. However, the second race got interesting when the sky turned black and only a few boats started the race with Coach Liam scooping up boats. Soon most sailors were upside down with a squall of 30 knots and hail. We promptly turned and made a beeline for shore. Again, everyone came together to make sure the RS Aeros and sailors made it safely to shore. The debrief really highlighted the key learning points for the weekend with video footage of the penalty turns showing some great tips and common mistakes that were being made. The formula for straight line speed and the importance of a flat boat was a key learning point to take away from the weekend. Thank you to all the coaches for braving the cold! The next Youth Training weekend on 9/10 March at Weymouth is one of two this winter that are open to additional sailors, facilitated by the addition of an extra coach. A few places still remain and RS Sailing have provided three charter RS Aeros to enable non owners to get involved. Full details are on the Event Page.